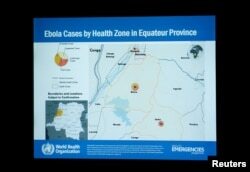 A slide is pictured during a briefing for World Health Assembly (WHA) delegates on the Ebola outbreak response in Democratic Republic of the Congo at the United Nations in Geneva, Switzerland, May 23, 2018. Health Experts at the World Health Assembly in Geneva agree the next few weeks will be crucial in determining whether the Ebola outbreak in Democratic Republic of Congo can be contained and prevented from spreading to highly-populated urban areas. Two weeks have elapsed since the first laboratory-confirmed case of Ebola was discovered in the remote, rural town of Bikoro in DR Congo's northwestern Equateur Province. Soon after the Ebola outbreak was declared May 8, World Health Organization Director General Tedros Adhanom Ghebreyesus and several associates went to the region to assess the situation. Tedros said he was pleased by the government's quick response. "The government had already triggered the community committees so that communities can take the ownership and contribute, and they are going house to house to identify cases and to identify contacts.Starting from the Government leadership, everything is triggered," he said. "We are watching it around the clock, 24/7, and we hope it will have a better outcome." This rapid response to the current emergency is a sea change from the way the WHO and other agencies reacted to the West African Ebola epidemic.More than 11,000 people were killed before it was brought under control in 2016. 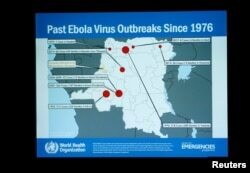 This is the 9th Ebola outbreak in DRC since the disease was simultaneously discovered in DRC and South Sudan in 1976. In the eight previous outbreaks, Ebola occurred in either isolated rural areas or in small towns where the disease remained largely confined. Peter Salama, WHO Deputy Director-General, Emergency Preparedness and Response, said the current outbreak has features of two previous typologies — a combination of rural villages, and larger towns and cities. These factors "have given us concern that the outbreak has the potential to expand," he said. "First is the involvement of a town — Mbandaka — which is the capital of the Equateur Province in that region with a population of more than 1 million people," he added. "Secondly, that town is on the Congo River and its tributaries, which ultimately connects this outbreak potentially to Kinshasa and also to surrounding countries such as the Republic of Congo and the Central African Republic." Peter Salama, Executive Director of the Health Emergencies Programme at the World Health Organization (WHO) attends a briefing for World Health Assembly (WHA) delegates on the Ebola outbreak response in Democratic Republic of the Congo at the United Nations in Geneva, Switzerland, May 23, 2018. He said five health care workers in Mbandaka have been infected with the virus, which is a potential signal for further amplification. He noted there are 58 confirmed and suspected cases of Ebola, including 27 deaths.He said health agencies and the government are actively following 600 contacts to learn the specific locations of the outbreak. "It is really the detective work of epidemiology that will make or break the response to this outbreak," he said. "It is documenting how people are getting infected and, therefore, managing control, the control of transmission. ... We are following three separate chains of transmission, and each one has the potential to expand, if not controlled." One potentially powerful tool for containing the spread of Ebola is an experimental, protective vaccine that was not available during the West African epidemic. More than 7,500 doses of the vaccine have been sent to DRC. Salama said a ring vaccination program began Monday in Mbandaka. "This is not mass immunization," he noted. "This is highly targeted ring vaccination where concerned or probable cases are identified and then each and every contact is traced and vaccinated, and then the contacts of those contacts are then traced and vaccinated, forming protective rings around that case — to protect the people themselves — the contacts, but also to prevent further community transmission." Salama said this is the same approach used in the 1970s for the elimination of smallpox. On a regional level, the World Health Organization has designated nine neighboring countries, which share porous borders with DRC at high risk of Ebola. Those most at risk are the Republic of Congo and Central African Republic.The others include Angola, Burundi, Rwanda, South Sudan, Tanzania, Zambia and Uganda. WHO Regional Director for Africa, Matshidiso Moeti, said WHO is helping these countries scale up preparedness so they can detect, investigate, and manage the disease. "We are helping countries to pre-position the supplies that they will need, including personal protective equipment, infra-red thermometers, rapid diagnostic test kits and other critical supplies," said Moeti. "We are working with members states and partners at all levels to scale up surveillance, detection, case management at the border areas surrounding the Democratic Republic of the Congo." Salama said the exceptionally rapid, robust response to the outbreak and strong multi-partner effort bodes well for the work ahead. "It is not over yet," he cautioned. "We are really just at the beginning ... we are on the epidemiological knife-edge of this response.The next few weeks will really tell if this outbreak is going to expand to urban areas or if we are going to be able to keep it under control." The World Health Organization is appealing for $26 million to keep the operation going for the next six months.It says strong, continued international support is essential for combating this deadly disease.